Happy Sunday, and to those who are celebrating Mother’s Day, a lovely afternoon. The thing is, I offered this reply lightly, with a smile. I wasn’t registering distress or confiding in him sadly (though it would have been fine if I had been). What made the moment special was the fact that I was in the midst of what I used to call a “bad body day” and feeling pretty OK about it. Just over a decade ago, I wouldn’t even have been able to speak so freely about a moment of low self-image. Back then, I didn’t only want to manipulate my body into being precisely what I wanted it to be: I also wanted to pretend that the results were effortless. I wanted the world to believe that I maintained my underweight frame without any effort at all, that I was simply immune to the ebbs and flows in self-esteem that affect so many of us. I was ashamed of my body—desperate for it to be something it wasn’t—and I was ashamed of my shame, too. Making peace with food came long before making peace with my shape in recovery. Whether or not one has struggled with an eating disorder, body acceptance is no easy process. The approach that works best for me is to adopt a position of body neutrality and body respect; a lot of messages about self-love, at least as it extends to body image, simply don’t feel authentic to me. But I made a vow to myself many years ago that I would respect my body and treat it well even if I couldn’t love its appearance, and I’ve kept the promise ever since. Even this position hasn’t always been easy, but with each year it gets easier and more automatic. I realized on Thursday that the embarrassment I used to feel about my body and my relationship with it is receding, too. That I could shamelessly (and even humorously) admit to someone who doesn’t know my story with food that I was having a moment of low body image marked a new kind of openness and ease about something that I’ve guarded secretively for a long time. In the past, I greeted bad body days with a playbook of coping mechanisms. They were valuable, but I need them less these days. I can feel uncomfortable in my skin without feeling as though I have to do something about it: I know that it’s just a passing feeling. I can recognize it without identifying with it. During last Friday’s panel, there was a long discussion of the word “recovered.” What does it mean? What constitutes recovery? When does one know that it’s time to identify that way? Many of the ED recovered dietitians present felt very strongly about using the world firmly; they noted that they think it’s important to model full recovery and hold space for it for their patients. I understand this completely, but the older I get, the more comfortable I am with the idea of being recovered in some ways, “in recovery” in others. I don’t engage in ED behaviors with food or exercise, and my body is at a biologically appropriate weight for me, which means that I’m “recovered” by many standards. I still feel old impulses or compulsions sometimes, but I don’t act on them, which I think is also an expression of recovery. But compulsion and a desperate yearning for control still pop up in other areas of my life, and without my ED to serve as an outlet they’re often fierce and persistent. My anxiety is worse now than it was when I could hide within the rhythms and routines of anorexia. Things come up that evoke my ED, even if they aren’t the ED itself. In this sense, I’m a person who’s “in recovery” and may always be—a process that doesn’t preclude my having a beautiful relationship with food and feeding myself. Yesterday I took a terrifying tumble down a long flight of wet subway steps in the rain. According to this morning’s urgent care visit and X-ray, I have a sprained wrist. Ten years ago, I think my immediate response would have been intense dissatisfaction with having a bodily impediment—possibly coupled with panic about whether or not I’d be able to exercise. These thoughts didn’t even occur to me. In the moments after the fall, I could only think one thing, which is how grateful I was that it hadn’t been worse: a head injury, a broken limb, taking another person down the stairs with me. And when I saw the X-ray this morning I could only give thanks that my bones, which I haven’t always been good to, were safe. This is my recovery: messy mornings of feeling at odds with my body, followed by moments of intense and poignant gratitude to it and for it. Being triggered now and then, but feeling secure in the transience of it all. Being able to joke about a bad day—not to hide my suffering, but because I’m treading lightly through the mud. Having a scare, and greeting it with more perspective than I ever have before. I’m entering this new week with deep appreciation of this body of mine and everything it gives me. 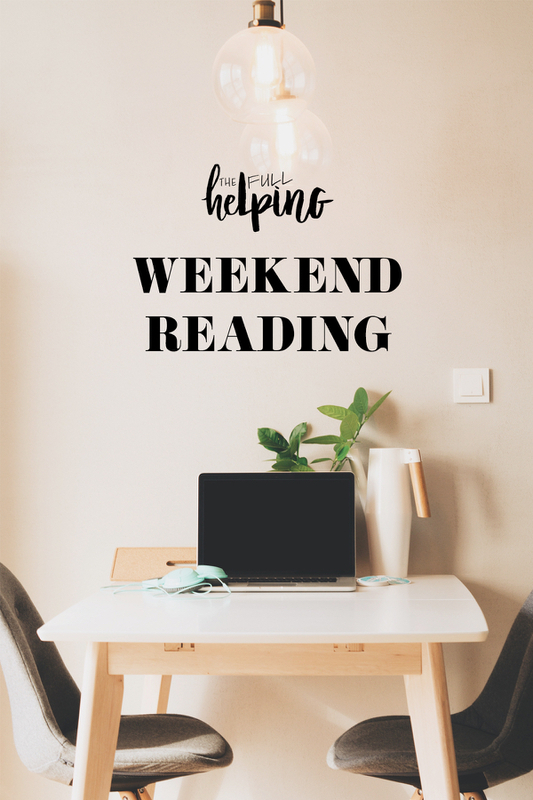 Happy Sunday, and here are the recipes and links that caught my eye this week. 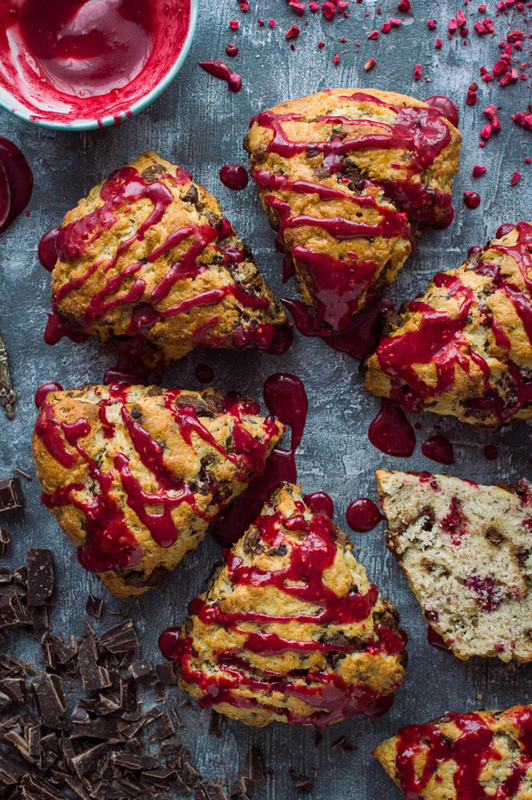 If I’d only had the energy for one-armed baking this morning, I’d have made my mother these delightful vegan chocolate raspberry scones for Mother’s Day. 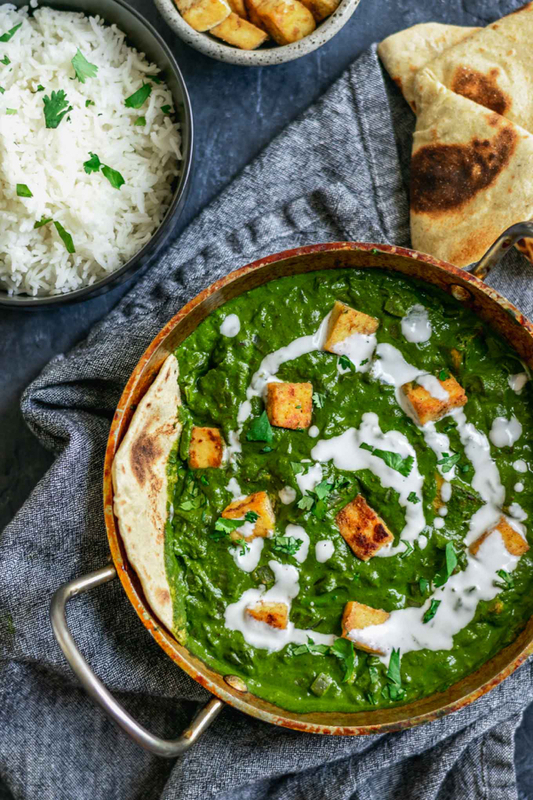 I’m blown away by the vibrant color of Eva’s vegan palak paneer. 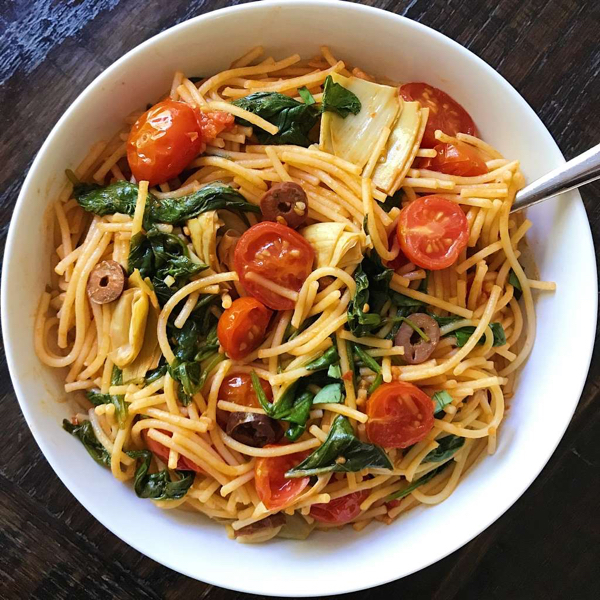 I have a feeling I’ll be making Karen’s simple Mediterranean veggie pasta all summer long. 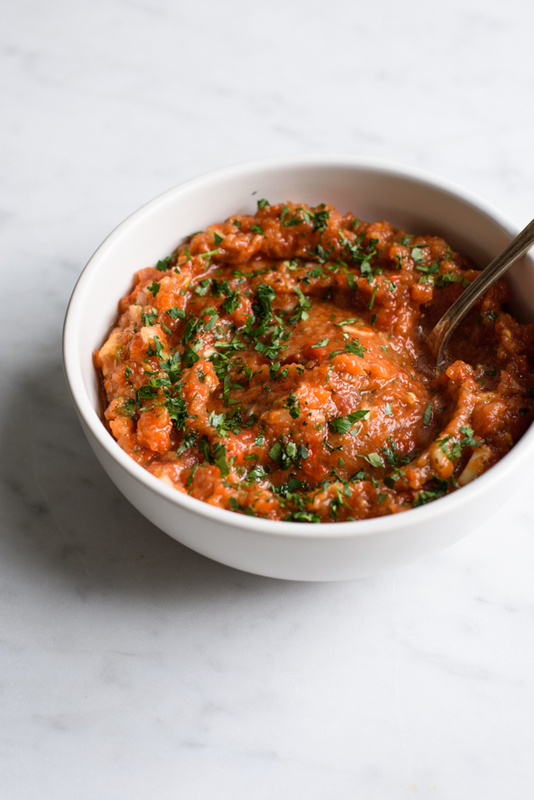 Another summery treat: Russian roasted eggplant spread, or ikra. 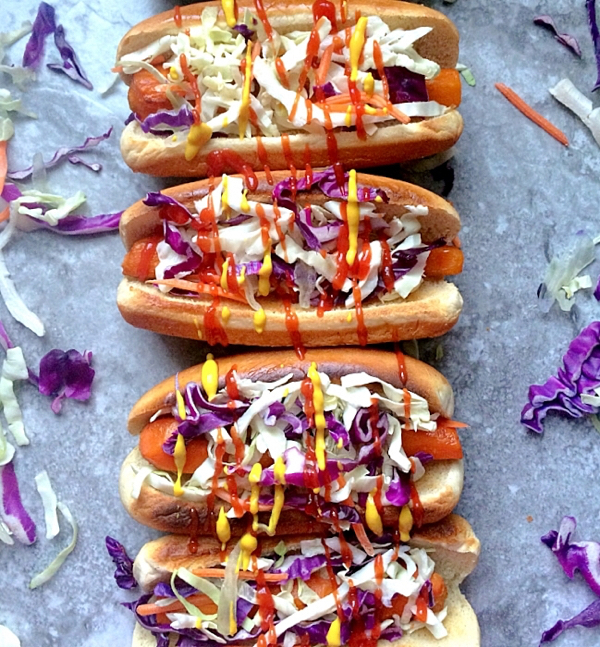 A totally genius vegan comfort food idea: carrot dogs! 1. In my work with clients, I’m always amazed to hear how deep and lasting the wounds of body shaming early in life are. According to a new study, being called “fat” in the early teens puts girls at higher risk for developing EDs, and the association is greater if the word is uttered by a family member. 2. I loved this: seven women reflect on their unconventional mother figures. 3. Vegan dietitian Matt Ruscigno addresses new disagreement about soy in an article for Today’s Dietitian. The controversy in question is whether or not soy still deserves the qualified health claim as being a cholesterol-lowering food. Whether the FDA revokes the claim or not, the evidence for soy as a nutrient-dense and beneficial protein source is still strong. 4. Smart ideas about how physician and nurses’ time can be better managed, freeing them up to deliver higher-quality patient care. 5. On a similar topic, thoughtful reflections from a third-year resident on whether or not it’s ever acceptable for doctors to give their patients gifts. I’ll be back tomorrow with a quick, easy, and delicious new breakfast recipe. Till then, be well! Gena, your words really resonated with me. I can relate so much with you and your journey to more self-love and appreciation. I’ve never been diagnosed with an ED but I went through a quite intense, secret bulimic phase and while I’m technically recovered, I still feel like being ‘in recovery’ in some respects and guess I will be always. It takes great courage to speak out about it, but it’s ever so important! So thank you for having the courage & sharing with us! I am so glad that you are OK! Our bodies are so resilient at times, even if we think we have habitually mistreated them and they will somehow not come through for us. They step up and do their thing! Your last post and this one have been wonderful. I was unhappy to learn though that some practitioners might say no to a vegan diet for those trying to recover from an eating disorder. I understand why I think but it seems like it would be adding insult to injury. These days my view has shifted (mostly) from something being solved to everything being a work in progress. Your comments to your yoga friend about your outfit remind me that we are continually in flux. At least that is how I have come to see things. I have anxiety myself (it’s a cornerstone of my personality) and even if I solve the problem of it in one area of my life, it crops up in another. A work in progress. Carrot dogs! Just crazy enough to be good. Hey Gena, it’s been a good while since I’ve left you a comment. I’m thrilled at the solidity of your recovery these days. 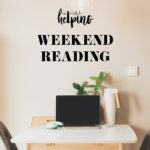 It’s a big deal to achieve that kind of awareness around old impulses or compulsions, to resist the temptation to give in to them, in particular in the face of so much anxiety. I feel in many ways I took the opposite tack: instead of facing my anxiety head on and just dealing with it in ways that didn’t involve starving myself (i.e. developing resilience), I just lived a more and more circumscribed existence (one that didn’t involve the sorts of challenges that would have triggered my anxiety). It was my way of protecting my recovery, but I do regret now not having taken more risks, especially professionally. I also never really developed positive coping strategies, so that for years into my recovery, I would still lose weight under stress (not consciously – it’s more that I would slip unconsciously into restricting behavior and only notice it a couple of weeks in). If it’s any consolation, I will say “body acceptance” was the last hurdle for me, I do still have bad body days (if I can call them that, that’s why I favor boyfriend jeans …). I don’t know if I’d have recovered as fully if I hadn’t made food the focus. It might have been risky (to make food such an important part of my life), but it’s what worked for me. I also think that good habits have a way of transforming our attitudes towards ourselves and our bodies in positive ways. I don’t any longer eat three meals as a matter of course, but for nearly I decade I was pretty regimented. And I think all that self-care led me to a point where I really did start to care. I’m a bit more relaxed now, but still grateful I have that stuff dialed in. Oh gosh, Gena, so much of this resonates with me – from the different aspects of recovery moving at different paces, to experiencing illness or injury that changes what movement is available to me at the moment, and this using up much less emotional energy than it would have in the past. I admire your gratitude and respect towards your body regardless of whether you “like” or “love” it. I may make a similar vow since that one has seemed to serve you well. More than anything, wishing you an easy recovery and ongoing gentleness towards yourself.